As I begin my tenure as president of Intelsat General I plan to continue our leadership role in bringing value to the government customer, and in particular, helping the U.S. government make better use of commercial satellite resources and investment. This means I will continue to execute on many of the priorities that our leadership team laid out a year or more ago, and reaffirmed early this year. In helping our customers make the best use of commercial capabilities and technology, we are focusing on three main priorities for this year. The first is providing our government and commercial customers with the best suite of secure and advanced solutions available for mobile communications in the air, at sea and on land. The second is to show U.S. Government stakeholders—particularly within the U.S. Air Force—how they can benefit by utilizing Intelsat experts to operate the government’s own satellite flight and ground networks—most notably WGS and the Air Force Satellite Control Network (AFSCN). As many of you already know, Intelsat very literally created the commercial SATCOM industry, and thereby set the gold standard for satellite operations. The third priority is to help the United States maintain superiority in space by participating in the development of a more resilient wideband space architecture by including commercial capabilities in all long-term SATCOM plans. A number of initiatives are underway to support a new era of highly advanced sensors in mobile communications. The most significant of these is the generation of Intelsat EpicNG satellites. The first Intelsat EpicNG satellite, IS-29e, launched in January, and the second, IS-33e, will launch in August with coverage over the Middle East and Africa. A key feature of the EpicNG spacecraft is the digital payload technology, first developed by The Boeing Company for use on the DoD’s WGS satellites. EpicNG satellites incorporate the most advanced digital payload commercially available and enable significant increases in throughput per MHz utilizing antennas as small as 12 inches. The digital payload also provides added security and anti-jam features much in demand by our government and commercial customers. Intelsat EpicNG spot beams limit the area from which a jammer can be effective. With the onboard digital payload, jammers can be detected and stopped at the satellite, thus preventing them from polluting the satellite’s downlink. In addition, desired carriers can be re-tuned to avoid the jammer and the onboard digital payload re-configured so the desired carrier still arrives at its destination at the original downlink frequency. The U.S. Air Force recently participated in IGC and L-3 Communications-led tests that validated the protected tactical waveform (PTW) modem performance over existing satellites with plans to re-validate the results over the Intelsat EpicNG platform. 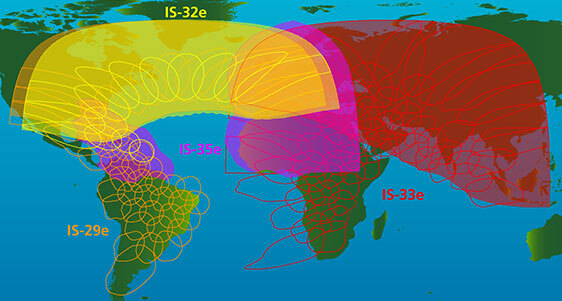 Several of our customers are anxious to test performance, PTW and other protected communication features on Intelsat EpicNG IS-29e, which has a footprint over the Americas, the North Atlantic and Europe. These customers want to test satellite throughput with various antenna sizes, including those used by remotely piloted aircraft like the Predator, on the smaller Class 3 RPAs, and on small ground terminals for mobile communications. Intelsat has partnered with two flat-panel antenna developers, Kymeta and Phasor, whose products are well suited to mobile applications and the Intelsat EpicNG platform. We plan to begin testing these antennas for our customers on IS-29 for aero, maritime and ground operations. In the area of assisting the U.S. Air Force with the flight and ground operations of its current wideband WGS satellites, the government has signaled its intention to take on a two-phased approach. The initial phase involves swapping out AF personnel for commercial personnel for the operation of their satellites from their satellite operations center (SOC) at Schriever AFB. In the second phase, we expect the service would contract with a commercial company to operate the WGS constellation in orbit using commercial teleports. The Air Force is expected to release a draft request for proposal sometime this summer. Last, but certainly not least, the upcoming Air Force Analysis of Alternatives (AoA) for wideband satellite communications will determine whether the service continues to launch and fly its own dedicated wideband satellite fleet, or it turns to commercial companies to provide communications capacity for the majority of its SATCOM needs, or something in between. IGC expects to be part of a broad industry engagement to support the DoD in this AoA so that our individual and collective capabilities can be “designed in” to the Space Enterprise Vision as envisioned by General John Hyten, Commander of AFSPC. Via this process, the DoD will be able to clearly see how the satellite technology being developed by Intelsat and other commercial companies can best support the U.S. military mission. I look forward to leading the Intelsat General team as our fleet and capabilities evolve with the kinds of features and functionality that our commercial and government customers need to achieve mission success, however that is defined. Over the past couple of years, new space companies have sought hundreds of millions of dollars in financing for projects as diverse as taking high-resolution images of every spot on earth every day; circling the Earth with hundreds of broadband satellite hotspots; landing on asteroids to mine them for precious metals; and measuring the atmospheric deflection of GPS signals for weather forecasting. Getting the latest hot technology into space, whether it is a higher resolution camera or a better propulsion system, is an exciting challenge. The DoD is beginning to take a larger role in seeking out commercial technology and innovation that could be used in space. The Pentagon is also working to change its acquisition approach to better take advantage of new technologies as they become available. This is especially important given the increasing threat landscape. Commercial satellite communications providers are in the process of launching a new generation of high-capacity spacecraft that will be a boon for their military customers. Government users will have a variety of services to choose from with throughput measured in gigabytes rather than megabytes and narrower, steerable spot beams that will help prevent enemy jamming, all with no development costs to taxpayers. “Industry is certainly leading the way with tremendous capacity — terabytes in orbit — and if DoD isn’t in line to access that, that is a problem,” Joe Vanderporten, director of the Air Force Space and Missile Systems Center’s Pathfinder office, said at a recent Washington Space Business Roundtable panel discussion on comsat providers and the military. Over the next decade, government and military end users in the United States and around the world are going to continue to unlock and establish innovative new uses of satellites to support broadband communications and the transfer of mission-critical data and information on a daily basis. The challenge for individual satellite operators will be adapting to the unique requirements of some of the new manned and unmanned airborne applications coming into the market. On the “Airborne Satellite Services for Government Needs” panel at the SATELLITE 2016 Conference & Exhibition, executives from SES Government Solutions (SES-GS), Inmarsat, Intelsat General, and Kratos Defense & Security Solutions gave their perspectives on how their companies are dealing with growth in demand for new airborne applications on manned and unmanned platforms. Intelsat General Corporation, a wholly owned subsidiary of Intelsat S.A. operator of the world’s first Globalized Network powered by its leading satellite backbone, has been awarded a second contract to provide satellite services to the U.S. Central Command (CENTCOM). The one-year contract calls for 288 MHz of Ku-band service to support U.S. military operations in the CENTCOM Area of Responsibility (AOR), which extends from North Africa through the Middle East and into the Central Asian countries of Afghanistan and Pakistan. Subsidiaries of Intelsat and L-3 Communications have tested a new automatic beam switching technology designed to help unmanned aircraft systems with the latter company’s satellite communications packages run on the former’s Epic high-throughput satellite platform. Intelsat General and L-3 CS-West aim to help UAS achieve throughput through Epic and subsequently validate the platform’s compatibility with existing aircraft, Intelsat said Monday. 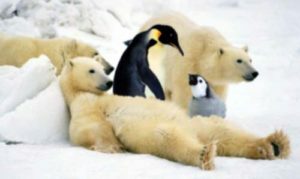 Although children’s books and animated films often show them frolicking together, penguins and polar bears actually occupy opposite ends of the earth. Polar bears are found in the far northern latitudes, while penguins occupy the world’s southern oceans and land masses. But Intelsat General provides satellite connectivity to customers with facilities at both ends of the world, one at the northernmost inhabited place on earth, and the other right at the South Pole. The northern outpost is an Arctic research facility and a weather and radio monitoring station operated in the province of Nunavut, on the northeastern tip of Ellesmere Island. The location is directly north of Greenland and about 500 miles south of the geographic North Pole, closer to Moscow than to Ottawa. About 75 government personnel and civilian contractors work at the station year round in a maze of connected buildings, surrounded from mid-October to the end of February in perpetual darkness and an average annual temperature of 17 degrees below zero. And yes, there are polar bears. Maintaining morale is vital to operation of the station, so the personnel posted there have amenities such as a tanning salon, gymnasiums, live television broadcasts and recreational facilities to pass their leisure time. The facility is regularly resupplied by plane from a U.S. Air Force base in Thule, Greenland. Data generated by the station’s activities as well as daily video phone calls home for station personnel travels via a six-station UHF repeater chain to a small weather station at Eureka on Ellesmere Island and then via Intelsat’s Galaxy C3 satellite to ground stations in Canada. Kevin Debruycker, IGC’s Customer Solutions Engineer helped implement this unique network which required a data link between the customer’s remote location and their hub in Ottawa. Due to the extreme low look angle the only suitable satellite was the Intelsat G-3C at 95.05 degrees west. The combination of low look angle and extreme temperature and atmospheric conditions required a two-antenna solution utilizing a “bouncing” technique for transmitting and receiving carriers. The two co-located antennas are vertically separated so that depending on the time of day, one or the other antenna can more effectively “bounce” the signal off the ground to the satellite. At the bottom of the world closer to the penguins, Intelsat General provides satellite connectivity to a research facility operated by the National Science Foundation at the Amundsen-Scott South Pole Station. The population at the station ranges from around 50 in the dark winter months to over 150 scientists and support staff in the brighter summer months. The service originally went through Intelsat’s Marisat-F2 spacecraft, but after retirement of that satellite, service shifted to Airbus’ Nato IVB satellite using the X-band. The communications signals go through the Oakhanger ground station southwest of London and then tie into the IntelsatONE fiber network for worldwide delivery of scientific data to colleagues at universities, phones calls home, video conferencing, software updates, and emergency telemedicine. The station at the South Pole uses a weather-hardened X-Band SATCOM terminal. Because of its location on the southern-most point of the Earth, satellite dishes at the Amundsen-Scott station are out of view of geo-stationary communications satellites orbiting the equator. However, the 20-year-old Skynet-4C satellite is in an inclined orbit and drifts slightly above and below the equatorial plane as it orbits the Earth. With its inclination now at 10.3 degrees, the satellite is visible to the South Pole for about five hours each day. The daily visibility will grow as the satellite ages and the inclination increases. The research at the South Pole is very “data-intensive,” with more than 100 gigabytes of astronomical, climate and other data being sent by satellite on some days. In addition, the satellites are used for Internet access, e-mail and routine communications with scientists around the world interested in the South Pole research. So even though penguins never see a polar bear, Intelsat General’s customers share the burden of freezing climates, months of darkness, and vital responsibilities at opposite ends of the earth. Jonathan Bae leads the Program Management Office (PMO) at Intelsat General, and is responsible for the team that interfaces directly with customers in establishing and maintaining satellite and ground services for activities around the world. He and his team of five Program Managers are actively involved in program implementation and escalation activities resolving service issues for over 70 customer accounts, including customers like the U.S. Navy’s Commercial Broadband Satellite Program and the Armed Forces Radio and Television Service. Bae, who joined Intelsat General in 2012, has been focusing on institutionalizing the PMO best practices. He recently put in place an IT Service Management (ITSM) platform, which is designed to improve Operational Efficiencies by enabling a flexible on-premise incident management ticketing system, integrating several custom-built databases into a single data repository, and implementing workflows and change management processes to better track service implementation activities. The ITSM platform assures that every customer service receives the same level of response and attention in the most efficient manner. Bae also coordinates communications between Intelsat’s teams and Intelsat General for upcoming IGC projects, capacity coordination for interference resolution and for the provision of new service requests. Bae began his career with the National Communications Systems, which is a sister organization of U.S. Defense Information Services Agency (DISA), where he was a program manager for wireless priority services used to formulate the National Security and Emergency Preparedness Policies. After seven years at NCS, he moved to Iridium as a senior operations manager, working on both customer-service issues and helped launch roaming services between Iridium’s satellite telephone network and terrestrial cellular providers. In 1999, he joined Nextel Communications, a major wireless provider and became director of planning and program management for their Engineering & Operations department responsible for the entire program portfolio. In 2005, he moved to QinetiQ North America, where he was a program manager and senior engineering manager, overseeing engineering and Integration activities for DoD and IC client projects, including analysis, acquisition, testing, and operations. Bae earned his electrical engineering degree at the University of Virginia, and has master’s degrees in both telecommunications and public policy from George Washington University. He and his wife live in Reston with their two children, where they enjoy the company of their dog Candy and 14 Koi fish in the backyard pond. They enjoy traveling as a family and are looking forward to a European trip in June.